Discussion in 'The War at Sea' started by bugleboy2323, Dec 23, 2012. CLOSE CALL. On December17, 1939, five ocean liners carrying 7,450 men of the First Canadian Division, arrived at Liverpool. Unknown to them, they had narrowly escaped what could have been a major sea disaster. The passenger liner Samaria, showing no lights, had passed right through the convoy unaware of the convoy's position. It struck the wireless masts of the escorting carrier HMS Furious on her port side, struck a glancing blow on the port side of the next ship astern, the liner Aquitania, then passed close down the starboard side of the third and fourth ships sailing in line ahead.. If the Samaria had collided head on with the Furious, the ships following would have all crashed into her. During the last three years of war, the Cunard liners Queen Mary and Queen Elizabeth carried a total of 1,243,538 American and Canadian soldiers across the Atlantic. Im hoping that any of our Canadian members, can shed some light on this event..? On the 12th of December Admiral Forbes sailed twelve of his destroyers to meet and bring in the first Canadian troop convoy. It consisted of five large liners, carrying 7,450 men of the First Canadian Division. That same morning Coastal Command aircraft, and also the submarine Salmon, sighted enemy surface forces in the central North Sea, steering west. We shall return to the adventures of this German squadron, which was actually on a minelaying sortie, in the next chapter. To Admiral Forbes the sighting reports presented a possible threat to the approaching Canadian troop convoy since, if the enemy ships were trying to break out into the Atlantic, they could reach the Fair Isle Channels late on the 13th. Accordingly he sailed from the Clyde with the Warspite, Hood and Barham screened by six destroyers. The enemy's intentions had, however, nothing to do with the convoy which, escorted by the Repulse, Resolution and Furious and covered by the heavy ships of the Home Fleet, arrived safely in the Clyde on the appointed day. The only untoward incident was a collision between the outward-bound liner Samaria and the Aquitania, one of the troop convoy, and also the Furious. It was fortunate that none of these three valuable ships received more than superficial damage. Enquiry revealed that the collision had been caused by the Samaria being given a route close to the inward-bound convoy's track. This happened because the routing authority in Liverpool had not been informed of the troop convoy's movements. Excessive security precautions are liable to produce unforeseen and unfortunate consequences. Seems like fog and miscommunication played a factor in the collision, which as noted could have been much worse. on December 16, 1939 she sailed from Liverpool for New York but was forced to return to port after a collision with an escorting warship. As noted above the Samaria collided with more than one ship this time! thanks Mark for the input,glad there was no loss of life. Hello all, I stumbled upon this forum when looking for info on the RMS Samaria. My father was in the 4th Canadian Armoured Division, arrived in England in 1942 and trained for the D-Day landings in '44. I have scanned his war photos and will be uploading them to a blog as a memorial to his service. However, the photo below was among some of his papers and not in his wartime photo album. 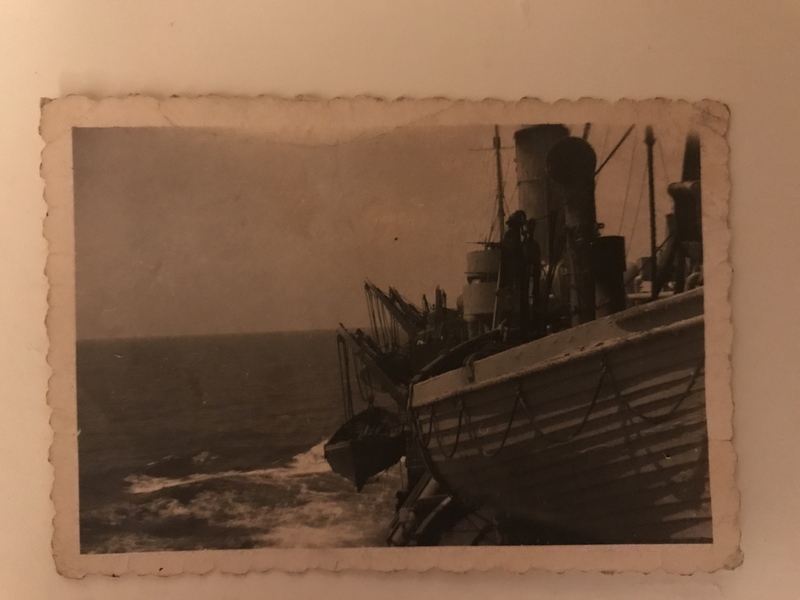 The back of the photo merely says: "Taken on the boat coming over in June." My father served in Northern Europe after D-Day. My uncle, whom I never met, was killed in action in Italy in 1944. The photo is of neither one, maybe one of them took the photo, but I cannot figure out where RMS Samaria was "coming over in June". Coming over to England? Coming over to Canada (or New York) after demobilization? Interesting to read this. 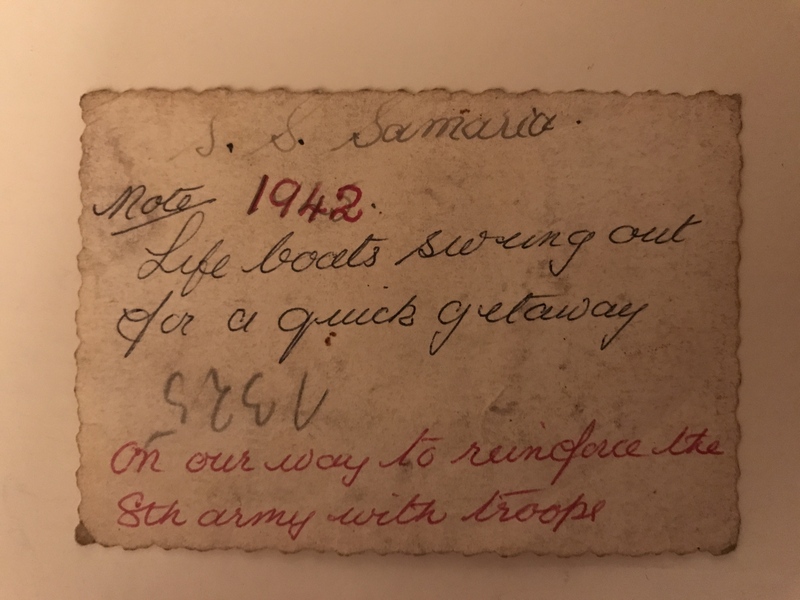 My grandad was on the Samaria in 1942. I just took this picture of an old photograph he took on it.